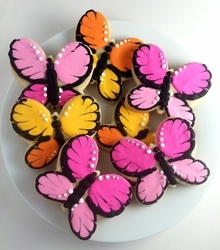 These beautiful hand decorated Butterfly Cookie Favors are large in size, and taste amazing! Our Butterfly cookies are a delicious and fun way to celebrate your special occasion! You get to choose 2 colors, the accent color and the icing color. These are a truly unique and custom cookie favor. Great for Birthdays, Bridal Showers, Baby Showers, Christenings, Baptisms, First Communions, Weddings, or any SWEET event. Each custom cookie favor comes in cellophane bag with curling ribbon. Trendy, fun, and affordable, our butterfly cookie favors will be loved by all! Ingredients for our butterfly cookies: flour, sugar, butter, eggs, vanilla, almond extract, baking powder and salt. Ingredients for icing: Powdered sugar, meringue powder, gum Arabic, and cream of tarter. NO PRESERVATIVES! These delicious butterfly cookie favors are frosted with royal icing that dries to a sweet crunchy topping will tickle your fancy and your taste buds.